These are some unfinished notes that I have taken while reading the Children’s Machine by Seymour Papert. Hope that someday I will weave them into something more fluid. One could indeed make kitchen math part of the School by making School part of the kitchen. Are there any snakes in the house? Yes there are, there are zero snakes in the house! So. negative numbers are numbers too, and their reality grows in the course of playing with turtle. You can’t retire from a good project simply because it has succeeded. The kind of knowledge that children most need is the knowledge that will help them get more knowledge. If the children really want to learn something, and have the opportunity to learn it in its use, they do so even if the teaching is poor. Constructionism looks more closely than other educational -isms at the idea of mental construction. It attaches a special importance to role of constructions in the world as a support for those in the head, thereby becoming less of a purely mentalistic doctrine. It also takes the idea of constructing in the head more seriously by recognizing more than one kind of construction and by asking questions about the methods and materials used. How can one become expert in constructing knowledge? Are these skills different for different kinds of knowledge? School math, like the ideology, though not necessarily the practice, of modern science, is based on the idea of generality – the single, universally correct method that will work for all problems and for all people. Use what you’ve got, improvise, make do. The natural context for learning would be through particiaption in other activities other than math itself. The reason is that the educators who advocate imposing abstract ways of thinking on students almost practice what they preach – as I tried to do in adopting a concrete style of writing – but with very different effects. keep everything else same. 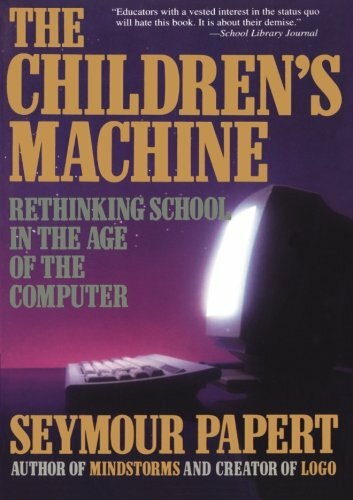 … But nothing could be more absurd than an experiment in which computers are placed in a classroom where nothing else has changed. The entire point of all the examples I have given is that the computers serve best when they allow everything to change. The concept of highly rigorous and formal scientific method that most of us have been taught in school is really an ideology proclaimed in books, taught in schools and argued by philosophers but widely ignored in actual practice of science. They count the same, but it’s more eggs. about how school teaches history). Its essence is the growth of a culture, and it can be influenced constructively only through understanding and fostering trends in this culture. I would be rather precisely wrong than vaguely right. It had been obvious to me for a long time that one of the major difficulties in school subjects such as mathematics and science is that School insists on the student being precisely right. Surely it is necessary in some situations to be precisely right. But these situations cannot be the right ones for developing the kind of thinking that I most treasure myself and many creative people I know. What computers had offered me was exactly what they should offer children! They should serve children as instruments to work with and to think with, as means to carry out projects, the source of concepts to think new ideas. The last thing in the world I wanted or needed was a drill and practice program telling me to do this sum of spell that word! Why should we impose such a thing on children? opportunity to develop bonding between children and science. Errors can become sources of information. different in that they used a different way of thinking. children, not because of the performance it /got from/ them. gender than how the gener will affect the activities. concrete style that uses objects. simplicity of the programs underlying the jam. collapse but provoke adaptive responses. from couting nails made rather than nails used. but also new ideas about learning would develop together. route to generating variety for the evolution of education. rigorously, select the best, and disseminate them to schools. In my view this is simply Gosplan in disguise. allow the operation of the principle of variation and selection. beleive in something by issuing orders. many immediate practical problems we have, they say. of scientific research on new forms of learning. on how children are taught. difficult and time consuming to master than the technique. calls for it not caught fire? Is reading the principal access route to knowledge? Ask a symapathetic adult who would reward her curiosity with praise. child’s mind like money in a savings account. /Tools/ for creating new experiments in effective fashion. which many factors must have time to find their equilibrium. * Vygotsky: Conversation plays a crucial role in learning. Why did the discovery method fail? mathematics. Computers can do this. The design process is not used to learn more formal geometry. science deals with facts; union of technology with biology. scientific thinking is most like there own thinking. Piaget’s first article: a paradox? of how human beings develop. measurements than by its participant’ intuitive understanding. that tomorrow will always be prisoner of yesterday. Example of Jet attached to horse wagon. Turtle lets you do this! Intellectual work is adult child’s play. educational goals of the traditional School. way you are told to do it. School spawned the projectof developing a Piagetian curriculum. Shaw: He who can, does; he who cannot, teaches. The system defeats its own purpose in attempt to enforce them. inspiring others to do something else. involved in the question what is and what is not mathematics. simply because some. or even most, are unwilling. \ldots mathetics is to learning what heuristics is to problem solving. that you are looking at the object for the first time? * What is the difference in learning at school and all other learning? like money, to be put away in a bank for the future. * What does /Computer Literacy/ mean? Computer as an expensive set of flash cards. If the students scores improve, our approach must be right. This entry was posted in aims of education, children, computers, constructionism, education, innovation, papert, sugar, xo. Bookmark the permalink.